The shoulder functions to place the hand in an appropriate position to accomplish tasks. In order to place the hand in a variety of positions, the shoulder requires freedom of motion. Although the shoulder is the most mobile joint in the human body, this amount of mobility comes at the expense of stability. Shoulder instability is a relatively common problem for this joint—as opposed to instability associated with joints such as the hip. Most shoulder instability however is the result of trauma. Shoulder instability from atraumatic events is less frequent. However, once shoulder instability begins, the likelihood of progressive instability and dysfunction continues to increase and leads to chronic shoulder instability. A right shoulder viewed from behind—note the shallow socket on the scapula articulating with the large ball of the humerus. Patients with acute shoulder dislocations experience tremendous amount of pain and typically require emergent treatment. This dislocations are typically the result of trauma and over 90% of these dislocations are anterior—meaning the humerus moves in front of the scapula. 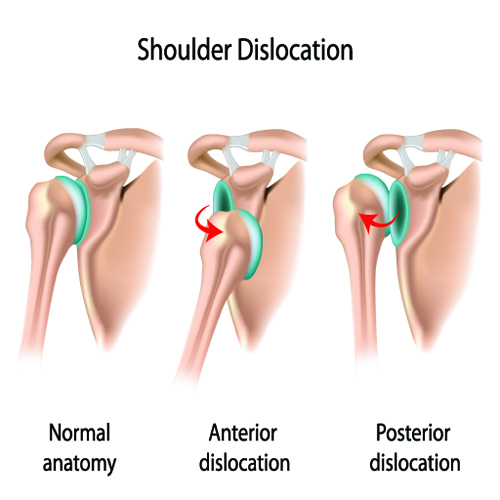 Posterior shoulder dislocations—when the shoulder moves behind the scapula are less frequent. These injuries may be associated with electrical injury or seizure. After taking a history to distinguish between traumatic and atraumatic instability, your surgeon will examine both shoulders. 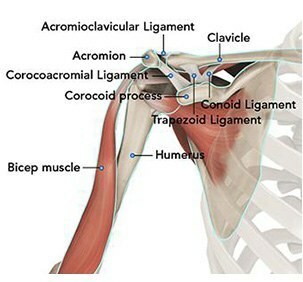 The range of motion of the shoulders is recorded and any differences from each side. The strength of the shoulder is noted and for patients with atraumatic disorders, an assessment of other joint instability including the elbow and hand is typically warranted. 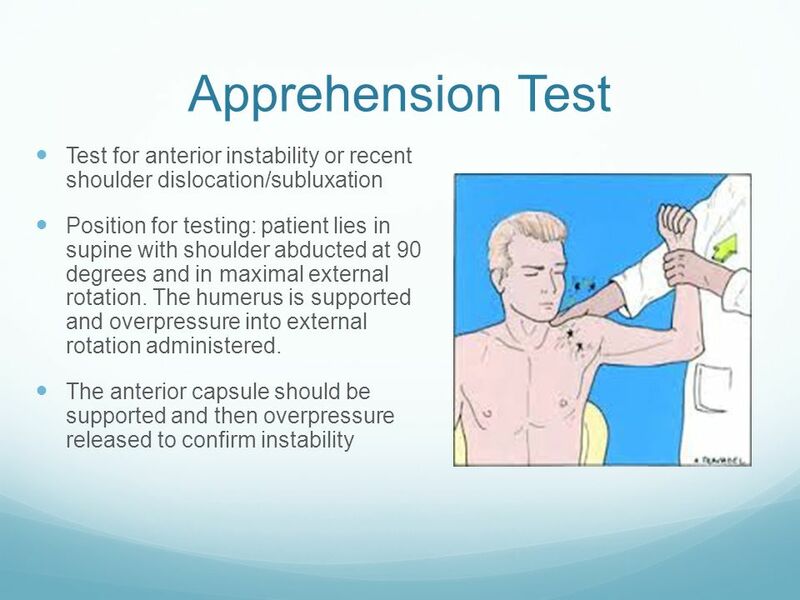 Specific testing for shoulder instability is them performed. 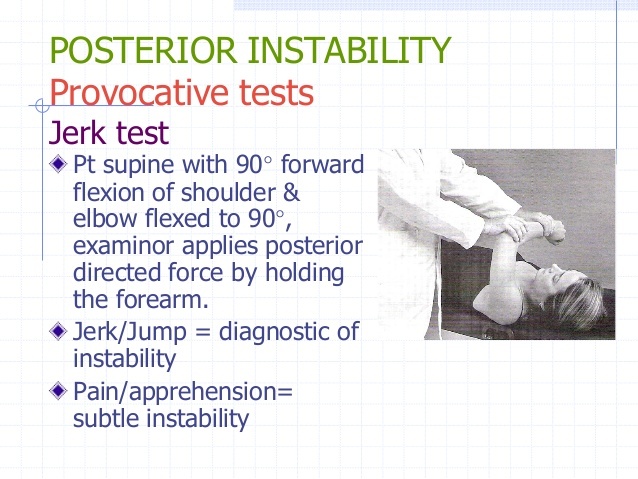 Testing for anterior instability is done with the apprehension test and posterior instability with the jerk test (see figures above). X-rays can confirm the direction of dislocation in acute cases. Further, x-rays may reveal bone changes associated with chronic instability—loss of bone stock or avulsion injuries. In cases of chronic injury these studies may be enhanced with MRI imaging of the shoulder which shows the soft tissue components of stability—capsule, labrum, and rotator cuff. Traumatic instability responds poorly to nonoperative management. Some studies shows a near 100% recurrence of instability for trauma with younger patients. Older patents with instability are likely to have associated rotator cuff tears. Cases of atraumatic or multidirectional instability are more common in younger females. These patients often respond to nonoperative treatment including a shoulder strengthen program. These programs may be accomplished at home or under the direction of a physical therapist. Some studies have indicated success in over 80% of patients treated. 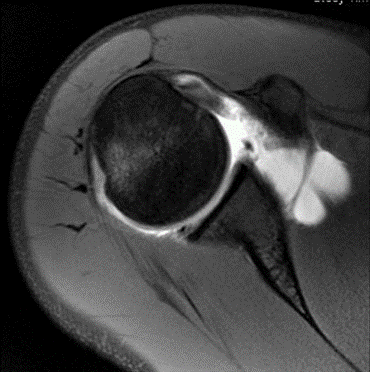 If patients continue to have symptoms, a shoulder capsular plication may be warranted. Most patients with traumatic shoulder instability will continue to have difficulty without operative treatment. 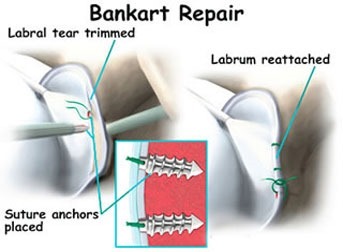 Operative treatment is typically aimed at repairing the capsular and labral tearing associated with instability—Bankart lesion. 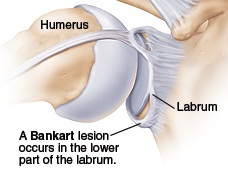 A right shoulder viewed from the front showing an anterior (front side) labral tear—known as a Bankart lesion. The operation may be performed under regional or general anesthesia–Many cases can be performed as an outpatient surgery. The repair may be performed through an open incision or arthroscopically. There are advantages to both techniques and choosing the best method may include patient age, sporting activities, and goals. Regardless of the approach, repair of the Bankart lesion typically is addressed with sutures and anchors which are inserted into the bone. After surgery, the arm is typically placed in to a sling to rest. 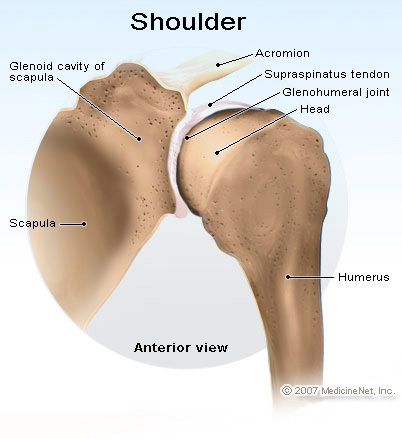 Shoulder motion is begun between 1-3 weeks after surgery and based upon the type of instability. Typically shoulder strengthening is instituted around two months after surgery. Shoulder strength and return to sporting activities begin 4-6 months post-surgery. Many studies have shown equally good outcomes for patients doing their therapy at home versus formal physical therapy. Improvements in strength and performance may occur up to one year after surgery. Recurrence rates of instability after surgery vary, but are typically around five percent.